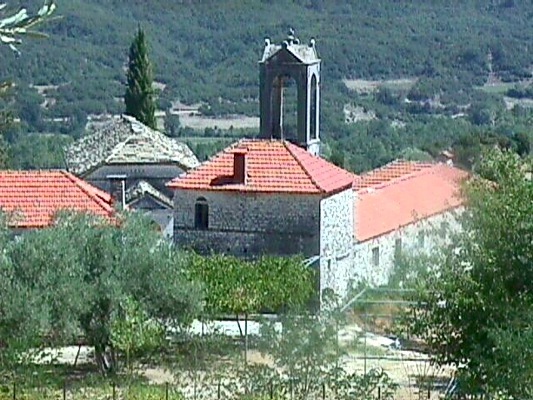 It is located at the village Romanos of Laka Souli and is dedicated to the metamorphosis of Jesus Christ. It was founded in 1113 by the Abbot Ioasaf and was destroyed a lot of times, the last time was destroyed in 1611. Parthenios I from Moukovina renovated it in 1866 and made it a centre for activities as: school maintenance, mess for the poor, guesthouse for teachers, etc. He was brave and daring and he saved a lot of times the monastery and its property by the Turks. It is one of the monasteries of Epirus that offered a lot of services even during the battles of Souliotes for their freedom. Nowadays is well-preserved. It has an abbey, cells, warehouses and the beautiful stone-built church. Sheds cover the whole temple. The high belltower separates from the chuch. It was built in 1900 by Karavellas, a builder from Konitsa. In the main church there are seats for women. The main church has domes and its wallpaintings date back to 1907 and they were painted by Parthenios II. It has one of the most marvellous woodcarving iconostasis. During the Second World War it was a centre for the warriors of the National Resistance.